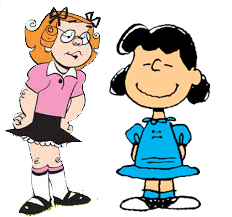 If you think back to your childhood, I’m sure you remember a kid like Lucy Van Pelt or Margaret Wade. They were irritating girls, at least from Charlie Brown’s or Dennis the Menace’s perspective; but they could just as easily have been irritating boys in your recollections. What was it about these kids? They were bossy . . . they ordered people around. Deep down inside, every kid and more than a few adults have just a little inclination towards bossiness. It’s not really acceptable in society, and most of us have learned to repress the urge to tell others what to do. If you struggle occasionally with the urge to give some orders, there’s good news for you. Today we’re going to talk about a way for you to release your inner Lucy. Even better, no one will object. We’re going to be writing about direct mail in the next few articles. If you want to know why you should be using direct mail in your marketing program, there’s a lot of information on this website. That’s not what we’re going to write about here, though. Instead, we’re going to present a few concepts that make your direct mail efforts more successful. One of the most frequent mistakes that marketers make is to assume that their audience will get the point. They tell a great story, use a pretty picture, and expect viewers or readers to draw an expected conclusion – that they should get in touch, or come into the store, or call, or buy something. Think about your reaction to this kind of message. Do you always make the conclusions? Nope. With direct mail, it’s not just ok to release your imperious tendencies and tell people what to do. It’s an absolute necessity. In marketing jargon, giving orders is a Call to Action (CTA). The idea is simple. Paint the picture, then tell people what you’d like them to do. You won’t offend them. In fact, they actually appreciate it. Be specific - Bring in this coupon. Register on our website. Donate today. Communicate urgency – This offer won’t last long. Try it right now. Minimize risk - There’s nothing to lose. Call today for your first free lesson. The best CTA’s are as specific, appealing, and urgent as Lucy’s instructions to Charlie Brown about kicking the football. Maybe that’s not the best example, though, because customers don’t appreciate it when the offer is pulled away at the last minute. That’s the topic for the next article – the offer, not bait and switch.